With $60 billion of transactions in 2016, the art investment market is comparable in size to the venture capital industry, which had $63 billion of exits within the same year. 81% of art transactions occur in just three countries: UK, USA, and China. Purchasers of art are divided into three categories: investors, traditionalists, and aficionados. 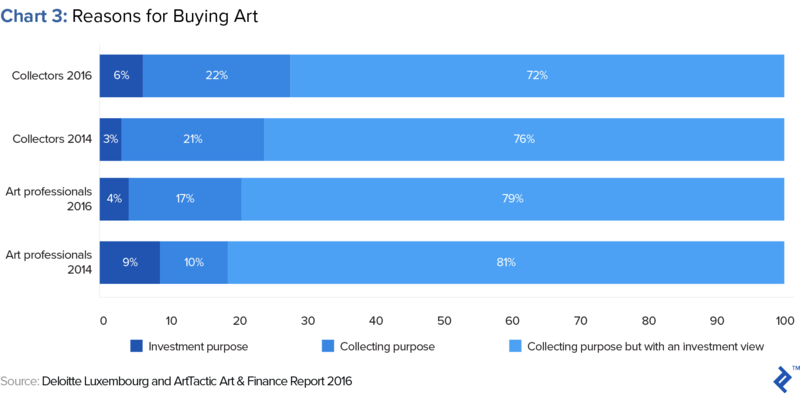 Despite these segmented intentions, 72% of all collectors state that their purchase of art has an investment view to it. Modern contemporary art and historic “Old Masters” are the most popular forms of art investing, comprising 65% of total transactions. The former is deemed to contain the most growth potential, while the latter is seen as the safest store of value. Data for art prices is opaque and relies on manual disclosure of transactions. For this reason, contemporary art is argued to suffer from price inflation due to survivorship bias. A catalogue raisonné is one of the best tools for validating and valuing a piece of art. Generally speaking, as a piece gets older, it collects more citations, which provides more certainty over its valuation. Validation of art by a noted gallery or critic can singlehandedly increase the value of a work of art by up to 30%. Is it a worthwhile asset class? Art can be defined as a luxury good that holds its value well. 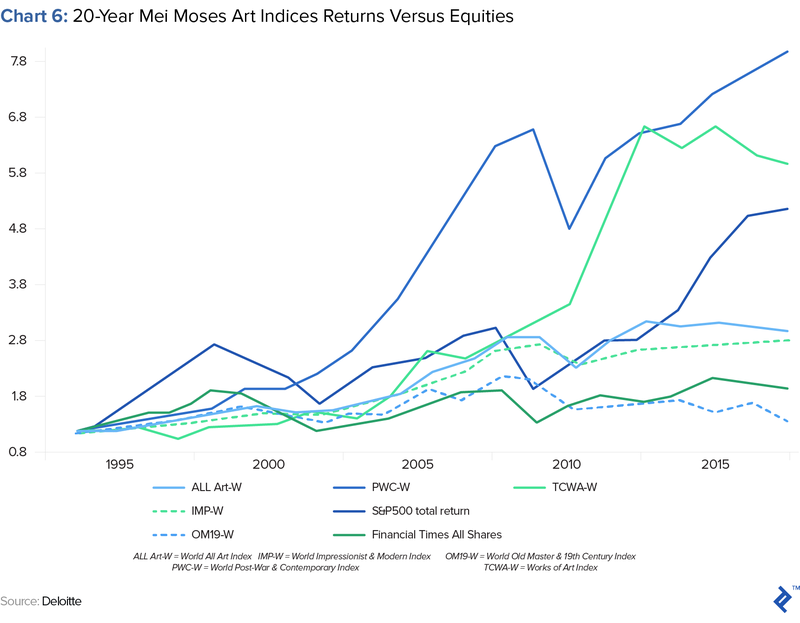 Investing in art (especially its contemporary forms) can bring returns higher than the equity markets, alongside correlation and inflation hedge benefits. However, this comes with the art market being opaque and and the underlying asset having negative carry. Art can appeal to the active investor that likes to participate in their investment after the check is cashed. This draws comparisons to early-stage startups or sports-related investing. Investing in the wider art economy could be a safer, more transparent, and more diverse form of gaining exposure to the art asset class—for example, art insurance and valuation services. Valuations doubling by the year, lavish parties, investors making 10x returns on some bets and losing it all on others, and intensely bidding on exclusive assets that produce negative cash flow—what does this all bring to mind? You might think that I was describing the venture capital world, but these are all (also) true of the modern-day art investment market. Well, at least the contemporary side of the market that is, but more on that later. It was only until relatively recently that venture capital funds began to be included in more conventional investment portfolios, but could art be the next asset to start receiving regular allocations from institutional investors? Does the art marketplace even deserve to be considered an asset class for institutional money flows? Although art receives far less attention in the financial press compared to venture capital or other alternative assets, it is becoming an important component of many high net worth individual (HNWI) investment portfolios. This article sets out to see what has been happening to fine art from a financial perspective and seeks to uncover what makes art investments a potentially interesting segment within a portfolio. To put things into perspective: With approximately $60 billion in annual transaction value, the art market has had significant and stable volumes for the past decade. Incidentally, these figures are in line with the value of venture capital backed exits, which were $63 billion in 2016. Because this market is relatively large, art investments and the wider market for “treasures” is becoming seen as a legitimate alternative asset allocation option for HNWIs within their portfolios. Wealth managers have picked up on this trend and have sensed opportunities to increase their service repertoire; now 88% of managers report that they intend to cover the asset class. Art is also a concentrated market, with “liquidity” pools focused in key markets. 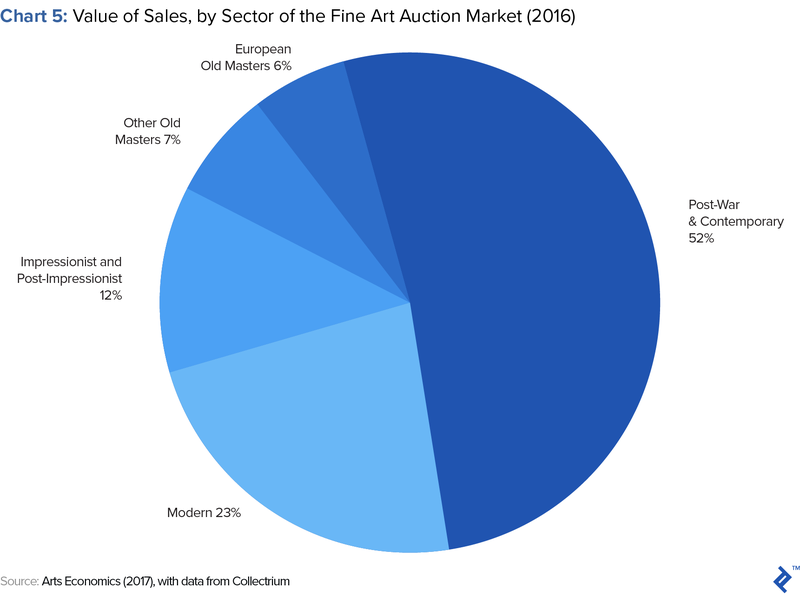 Although collectors and artists alike are a diverse global group, 81% of art transactions occur in just three countries (US, UK and China). These are, of course, not mutually exclusive elements, but equally so, are far more diverse than reasons for buying a stock or bond. Yet a common link between these buyer groups is that many art purchasers actually consider themselves to be collecting, but with a financial investment view. This mixture of emotion with investing makes the financialization of art a fascinating asset class to study. When art is included under someone’s net worth, or pledged as collateral for a loan, it can drive investor behavior in far different ways compared to “traditional” financial assets. Art is defined by its stylistic period, which reflects the timing of when it was created. Old Masters and contemporary/modern are the segments that receive the most attention, yet both have divergent investor characteristics. This draws clear parallels between the styles of value and growth investing that we see in equity markets. According to David Nahmad (who, with his brother, has one of the most valuable personal art collections): huge, era-defining Old Master artists like Monet and Picasso “are like Microsoft and Coca-Cola. We know the return is less big than on contemporary painting, but at least it’s more secure.” This can be seen when we compare indexed returns for the art styles. 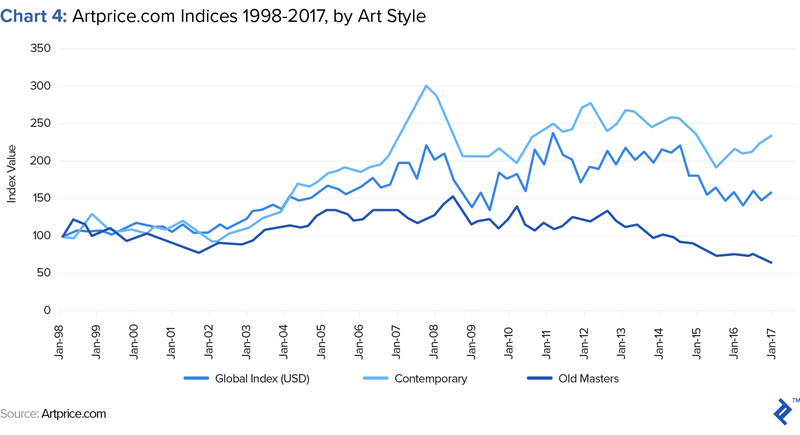 Observing the past 20 years shows that contemporary art has outpaced the gains made by the broader art market, albeit with higher volatility. Up until the Financial Crisis in 2008, 10-year contemporary art returns were up 200%, which promptly halved by the end of the year. Old Masters, on the other hand, had lost value over the course of the study, although with far less variance of returns. Indeed, the correlation between contemporary art and Old Masters is not strong. On my calculations from this artprice.com data, it was only 0.34. It is worth noting that the art market is notoriously opaque and that getting good quality data on prices is difficult. It is often argued that contemporary art price indices suffer intensely from survivorship bias, a luxury that of course does not apply to century-old Old Masters. 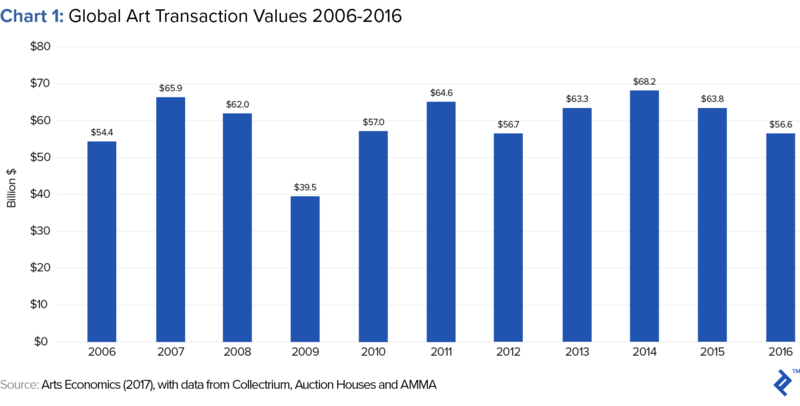 To illustrate the point, if a contemporary work declines in value, it often remains on the collector’s wall rather than go to auction, and so does not offer a data point showing declining prices. In the absence of historical context, contemporary art relies on buzz, momentum, and institutional support to maintain ever-higher prices. Old Masters are more self-sustaining due to their historical pedigree, which affords them a more established price range. The same can be said about wine, where the revered great wines of Bordeaux fetch high prices due to the deep history of vintages that can validate continuing quality. Instead of tasting a wine, art investors can refer to a catalogue raisonné to authenticate a prospective piece, which will show more data points the older the piece is. As such, investing in a contemporary artist can be a financial leap of faith, and yet despite this prevailing worry of “caveat emptor,” contemporary art investments constitutes 52% of the entire art market. With the vast majority of contemporary art pieces doomed to a future of obscurity and an unprecedented proliferation of the sheer volume of works being created, could contemporary art be merely the latest rendition of famous historic bubbles? According to a number of sources, New York art critic Jerry Saltz has a rule of thumb: “85% of contemporary art is bad.” It does not appear that there is much disagreement with this figure, but rather that we must remember that one never sees the 85% of “bad” art created in the past because of, well, survivorship—and it can be said that a full century is a good test of value in the art market. The temptation is for a collector who believes themself to be a maverick and able to select the “good” 15%, in which case, they can buy contemporary art at a fraction of the price of a Velazquez master and watch the piece reach Velazquez-like pricing over time. Value investing at its finest. The concept of provenance is critical in the art world. If a piece was originally commissioned by Cosimo I de’ Medici and has been hanging in the Uffizi ever since, its provenance would be considered impeccable and there would be little doubt over its authenticity. With contemporary art, provenance takes a different form, as there is typically no doubt over the origin and authenticity of the work, but rather it is that the value is deeply uncertain. Validation is the driver of value in the art marketplace and, as with modern marketing techniques, this can be achieved through organic or paid channels. Historically a cottage industry, new upstarts are attempting to streamline the process of bringing new art into targeted gallery venues. This helps to publicize it and bring validation through association with a respected gallery, biennale or museum. When I asked Premala Matthen, an art market advisor, she said that this kind of validation can increase the value of art pieces on average by 20%, but oftentimes by 30% or more. This process of validation (and thus, “valuation”) is of course subjective and clouds the process of determining the fundamental value of art. With certain gatekeepers presiding over the ability to singlehandedly increase art value by 30%, it gives rise to a market with far more uncertainty than traditional financial assets. Sure, a Sanford Bernstein report or Sequoia Capital participation can have a significant impact on asset prices within their respective areas of equities and venture capital, but rarely to the magnitude of 30%. Taleb elaborates on the idea in his book, Antifragile, in which he defines “Neomania” as the “love of the modern for its own sake.” We are constantly in pursuit of the next trend, but how can you know that something will last if it’s only been around for a year, offering no information on its future longevity? This draws parallels to the current cryptocurrency craze, where investors are clambering to buy coins that they hope will change the world, but with rhetoric largely trumping fundamentals, they are really just hoping that they stumble upon The Next Big Thing. Better to Sell Picks and Shovels to the Miners? It is difficult to definitively make a case for making art investments. In a similar manner to traditional assets, such as equities or corporate bonds, there is a spectrum of opportunities ranging from staid value to enticing growth. To complicate these buying decisions, art offers plenty of non-financial “intangible” returns too. But from a purely financial standpoint, it is hard to make the case for investing (as opposed to speculating) in anything but Old Masters, or era-defining artists such as Picasso. Even that is still risky, if we refer back to Chart 4, we saw that Old Masters have actually lost real value over the past 20 years. While art does have some interesting diversification benefits, such as having almost no correlation with equities and acting as an inflation hedge, it can also have negative carry due to storage and insurance, and very opaque market idiosyncrasies. This dictates that potential investors must be both liquid and savvy, and analyze their decisions carefully before diving in. Contemporary art stands out as the sexier side of the market and offers a method of speculating on emerging talent with a high cost of entry, but potentially huge returns. Contemporary pieces have actually outperformed equity index benchmarks over the past two decades. With a more hands-on process than just calling a wire-house equity broker, art investments, like race horses and seed-stage investing, are indisputably more fun and exciting for the active investor. Art, and especially contemporary art, if desired, can serve as a type of conspicuous consumption that gives one a ticket into “society” and serves as proof of exclusivity. To sum up, art writ large should really not be considered an asset class as such, but rather a luxury good that in many cases holds its value relatively well. But the same could be said for the wider “treasures” market, comprising classic cars and vintage watches. The spectrum is wide, however, with some categories of art—namely, household names that have stood the test of time—possessing more asset-like qualities that could very well find their deserving place in an endowment or family office portfolio. How can art be valued? Art valuation is a subjective process that is fundamentally driven by the reputation of the artist behind a piece. How effectively stakeholders in the art world are promoting an artist to critics, curators, and investors will serve as a measure of the success and value of the piece. What is an investment in art? Purchasing a piece of art with a view to potentially sell it in the future for a profit constitutes an investment in art. This can come in the form of the outright purchase of a work of art, buying a share in a piece, or investing in a related industry connected to the art world.